I started this blog in 2010 when I was preparing to graduate college and head to seminary. In deciding to go to seminary, I seemingly defied all conventional wisdom by turning down a great job offer in my hometown to follow God’s call on my life. So I decided to start this blog to chronicle my journey on this new path and dubbed it “Adventures of My Own”. Fast forward to marriage, medical school, graduation, and a baby. These adventures are no longer just mine, but ours. Amazingly, even though so much has changed, so much has stayed the same. We’re still just a couple of simple people trying to follow God’s call for our family and experiencing the adventures He has for us along the way. We’re Christians, the Catholic kind with Baptist roots which makes us sound much more interesting and complicated than we probably are. 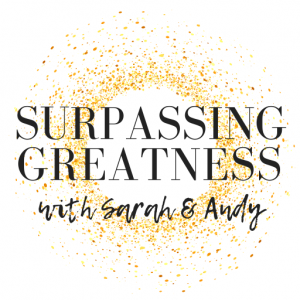 The blog name has since been updated to “Surpassing Greatness” coming from Philippians 3:8, a verse that we’ve adopted to summarize our mission as a couple. Our big claim to fame is our annual food review of the fried delicacies at Hillbilly Days. You don’t want to miss it! Fried food is our calling! We have to spend the rest of the year detoxing, but it is worth every bite. Faith, family, and devotional writing is my thing so that’s what you’ll see most of on the blog. Food reviews, that’s Andy’s forte. Occasionally it makes an appearance on the blog, but most often you’ll find his reviews live over on our Facebook page. In my head, I’m always very well spoken and clever but in reality, I’m a math major who has to work really hard not to start every sentence with the same word. The words I write here are things that spill over from a very intimate place in my head and my heart. I’m glad that you’re here, come share the journey with us. Very nice wedding pictures, looking forward to having some of my own! Hi Sarah, (person who grades my Hebrew quiz every week), I’m so excited to see that you have a blog b/c I love to read them….don’t have one of my own just yet, but maybe soon! My concentration is in Christian Ministry as well btw so we have a little something in common. Anyway, I’ve enjoyed getting to know you in Hebrew class and hope that our friendship can grow more as the months go on! Well they had the frosh BCM/Local Church service this morning at W&M. Annie presented for Living Proof. We are looking forward to the students coming back next Sunday. It is hard, though, knowing that you won’t be among them That will take some getting used to. The class has held together this summer with the college group gone. In previous years we didn’t have enough in the summer to have a really good class and often combined with Dean’s class. This summer we did pretty well. There were nine this morning. We had a really different service this morning. An, intentionally, small praise team. Sam and Leon on guitars, Bethany of the Jimbe drum, and Rachel and Monda for our voices. Sam also sings — he has a great and well trained voice. Eric started a series of 9 lessons on prayer with Acts 1 & 2. This is in preparation for our partnering with a church in Egypt. Eric, Greg, Matt C.(our son), and Dean go to Egypt mid October to work out plans for the next 3 to 5 years. We will be doing 40 days of prayer ending with their last day in Egypt. That last day is a Sunday and we are hoping to have a Skype hook up with Them in the church there. I will be preaching on Matthew 24:3-14 & Revelation 7:9-10, titled, The Alpha of the Omega, translated, The Beginning of the End. There is some other news also, but I will end now — up at 6:00 am for Men’s Small Group at IHOP. We love you Sarah and are missing you already. P.S. Always remember, God is the God of first resorts, not the God of last resorts. He is very interested in the details, the very smallest of details. Hey Sarah, congratulations on graduation and good luck as you go on to seminary!